When you are beyond excited about your job prospects after months of campaigning and pulling out the stops in an effort to nail the job or your dreams, you might need to hit pause before you sign the offer letter and make sure you have thoroughly read the job description. Before you say, “Yes! to the job!” you may need to read the fine print in terms of what the job entails and what you think you should be doing before you accept your new role. It may all look great from the outside. You could be swept up in the excitement of the title, the position, the prospects of a larger scope of responsibilities, travel and all the perks that may come along with accepting a new position. You may have charted this course for a long time and it’s now finally arrived. Hold up just a minute please! Now you’ve heard a rumor that they may need for you to move to change your physical location and you may report to someone else and work with another team. Before you start packing, it might be wise to pause and make sure this is all that it was intended to be and there are no more surprises waiting for you. You may have been blinded by the light of the offer and forgot to fully read the details of your new position and who is really calling the shots here. You’ve got to ask yourself, Are you ready to lead or are you ready to follow the lead? If you think you are the job, and it doesn’t really matter, think again. You need to make sure you kick the tires in terms of what your role will include and not take for granted that you will figure it out once you get in. Knowing the full scope of your role includes understanding your professional relationships and evaluating the interpersonal dynamics of your new work environment and the people you will be forced to work with as well. Your job description should provide a road map for you to dig deeper in terms of the expectations you and others have of you before you say yes to the offer. Working above or below your pay grade will determine how well you succeed in the job. Know what you are getting into before you tender that resignation. You may think you bring a unique set of skills or point of view to the new job. But, if you are not a match with what is expected of you changing the rules mid-stream is not necessarily a good or available option. You have to not only think of how the new job will effect you but how will it effect your family. Maybe you have a spouse or partner who is not interested in making a move. Maybe your kids have special needs and your new role will force them out into the spotlight before they are ready or able. Taking stock of your situation personally as well as professionally, before you agree to accept the full responsibilities of your new role whatever that may be, is a crucial step in being honest with yourself and with those that really matter. It’s not a sign of failure if you decide this job may be more than you bargained for. Even if you won the final offer after exhaustive interviews, you need to make sure this is what you really want and that it’s right not only for you but for your family as well. When you rely on the opinions and comments of others you may be forced to make and accept decisions that are not right for you. 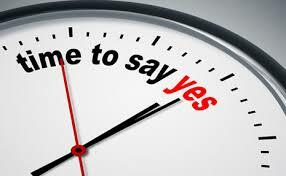 Think long and hard before you say yes to the job, no matter how tempting the offer appears to be.